I brew kombucha on a pretty constant basis these days. I first discovered the drink a few years back, and was instantly hooked. I’m all about fizzy, sour drinks and kombucha is about as fizzy and sour as it gets. That was a little 12-ounce bottle of store-bought kombucha, sold for around six bucks. My cheapness is what got me started on home kombucha brewing, but the fact that it turned out a billion times tastier than the store-bought stuff is what kept me at it. Home kombucha brewing is a weird and, okay I’ll admit, kind of freaky process. But it’s fun too, I promise, and super easy. 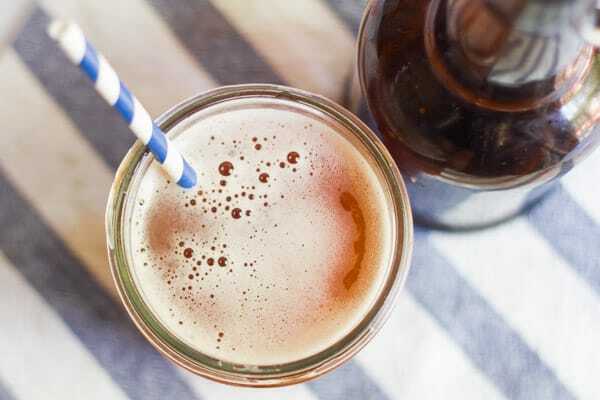 I got started during the summer, which is the perfect time to start brewing, as the high temperatures help the process along, and you end up with a cold fizzy beverage to help you keep cool. Special containers for kombucha brewing are available, but by no means necessary. Anything made of glass that holds at least a gallon and has no metal parts (with the exception of stainless steel) is just fine. I’ve successfully used large mason jars, cookie jars, and a lemonade container with a tap. 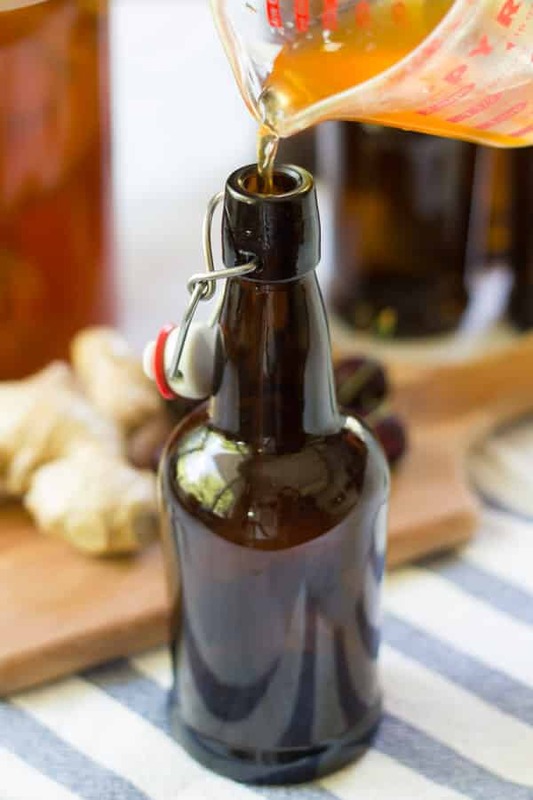 You’ll also want something to bottle up your kombucha, and your best bet is to get some beer bottles that are normally used for home brewing. Make sure they seal tightly. Aside from that, you probably have everything you need on hand, but for thoroughness, make sure you’ve got a large pot and spoon. A funnel comes in handy too. Avoid using anything made of metal or having metal parts, which react badly with kombucha cultures. Again, stainless steel is an exception. 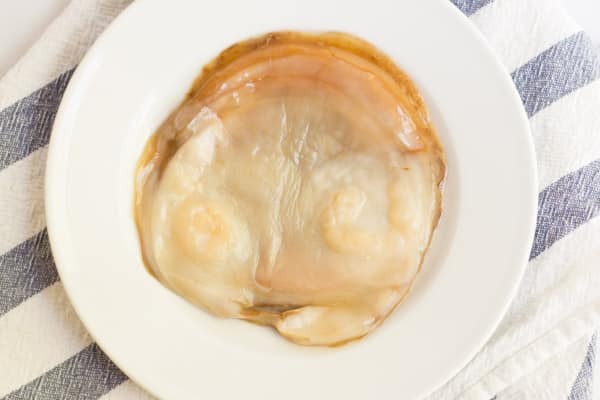 The key ingredient to a batch of home-brewed kombucha is a SCOBY. That’s Symbiotic Culture of Bacteria and Yeast, for anyone interested in kombucha geekery. 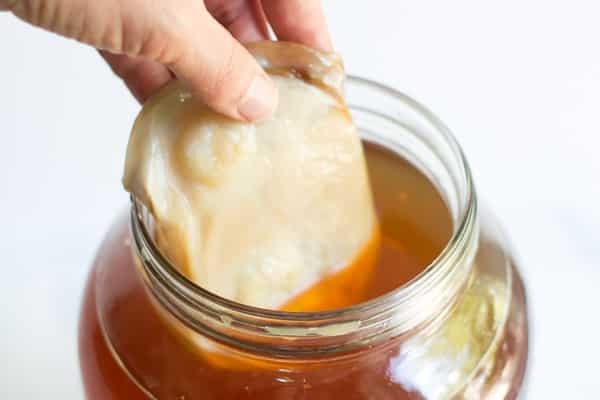 For kombucha-making purposes, all you need to know is that it’s a big slimy blob that houses the cultures used for brewing. The best place to get a SCOBY is from another brewer, because, as if big slimy blobs aren’t already freaky enough, they multiply during brewing, so most regular brewers have lots of them. Ask around, but if you can’t get one from an acquaintance, you should be able to find one online for purchase. You’ll also need some filtered water, apple cider vinegar, tea, granulated sugar and optionally, fresh fruit or juice. Remove your tea bags, add a cup of sugar and stir until it’s dissolved. I know, that’s a lot of sugar! Most of it gets eaten up during fermentation, so the end product is more tart than sweet. Let your tea cool completely. 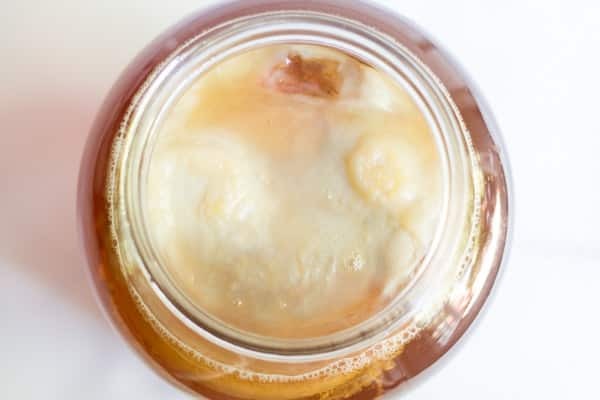 The SCOBY is loaded with bacteria, and the last thing you want to do is kill off some those bacteria with heat. Once it’s cool, pour it into your brewing container. The cultures need a slightly acidic environment to get to work, so add 1/4 cup of apple cider vinegar. You can also add 2 cups of kombucha, which you’ll want to do for your next and subsequent batches, but for now, since you probably don’t have any booch on hand, vinegar works! Next, plop the SCOBY into your tea. Cover the opening with a paper towel or coffee filter, and hold it in place with a rubber band. Fruit flies love kombucha, so make sure there are no gaps that they can get in through. Place your container in a spot that’s out of direct sunlight where the temperature is between 70° and 80°F. Next is the boring part. Wait. It should take between 7 and 10 days for your kombucha to get to full strength. In the meantime, keep an eye on it. After a few days it should start to smell sour, and you’ll begin to see a new SCOBY forming on the top surface of your tea. It will start to get fizzy too! The higher the room temperature, the faster this all happens. I usually begin taste-testing around day 5. Once your brew is finished, it’s time to bottle it, and you’ve got two options. If you like a basic, unflavored kombucha, simply bottle it up, leaving very little head space in each bottle, and stick them in the fridge. If, on the other hand, you would like a little extra flavor, it’s time for a secondary ferment. You’ll want to add something sweet, so you can get more fermentation going on after bottling. I usually just add 1/4 to 1/3 cup of whatever juice I have on hand to each bottle, or a few chunks of fruit. I’ve also been adding a few slices of fresh ginger and turmeric lately – it doesn’t add much in the way of sugar for fermentation, but it does add flavor and nutrients. Once your bottles are full and you’ve added your secondary fermentation material, seal them up and let them sit out at room temperature for 1 to 3 more days. During this time, the cultures in your kombucha will eat up the sugar in the fruit, and you’ll end up with a brew that’s extra flavorful, and extra fizzy. Store your finished kombucha in sealed bottles in the refrigerator. Make sure it’s fully chilled before you pop one open – you want the pressure to go down so you don’t get sprayed in the face. Fermentation will continue at a slower pace, so don’t let it hang around too long, otherwise it will get undrinkably sour. You’ve also got an extra SCOBY at this point. Store it in some heavily sweetened tea in the fridge until you find a new brewer in need. What happens if I don’t get a second new scoby forming? If you don’t see some signs of a new SCOBY after a week or so, it probably means something is off. I’ve had this happen when I forgot to add vinegar or kombucha to the batch, not added enough sugar, and when the room temperature was too low, so I’d double check all of those things – they’e all easy to fix. 🙂 The other issue could be a bad SCOBY, so if all else fails I’d try starting again with a new one. I’ve been brewing for almost a year now and some of the things you’ve said in this how to article is totally wrong. Lots of people strongly discourage using ACV, as that’s a different culture altogether. Rather than using that you can just put sweet tea and a scoby and wait a week or so and then you have a starter. Secondly, and the BIGGEST problem here is that you’ve recommended storing the extra SCOBY in the fridge. This is the biggest no-no because it promotes mold and it might or might not work for brewing after the fridge. Instead of the fridge, put the extra scoby’s in a scoby hotel on the counter. Hi Melissa! I’ve been brewing for a few years now too, and I’ve never had a problem with either the cider vinegar or storing SCOBYs in the fridge. The only time I actually had some go moldy was when I tried keeping them out of the fridge. I appreciate your feedback though, and I’ll definitely do some reading up on both of those issues.